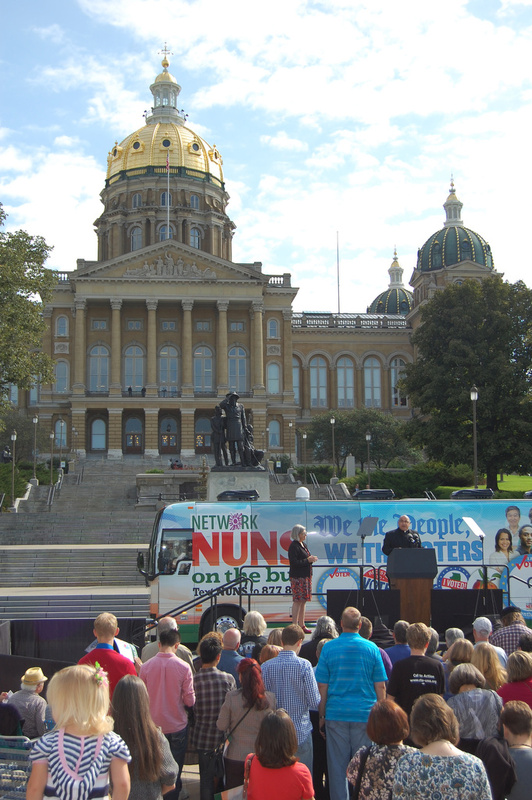 "We the people, we the voters" is the theme of the third "Nuns on the Bus" tour, which kicked off Sept. 17 in Des Moines with Vice President Joe Biden thanking the sisters for their effort. The sisters began a 10-state tour promoting voter registration and participation in the political process. "With the vice president, we share faith and a commitment to democracy," said Sister Simone Campbell, a Sister of Social Service, who is the executive director of Network, a nonprofit Catholic social justice lobby. To Sister Simone, Biden said, "I want to thank you and all your colleagues for your commitment and fight for basic economic rights." "It gives me renewed faith," he said on the steps of the Iowa Capitol. "It's been a great honor to work with Sister Simone over the years on so many critical issues." Two years ago, the "Nuns on the Bus" tour began in an effort to discuss the ramifications of a budget proposal of U.S. Rep. Paul Ryan, R-Wisconsin, which they said would have hurt social service programs that help the poor. Last year, the tour focused on immigration reform. This year, the focus is on voter registration. In the last eight years, there were 81 pieces of legislation in state capitols across the country that would have curtailed people's right to vote, he said. "The nation is strongest when everyone's voice is heard and everyone has a seat at the table," Biden said. Referring to Sister Simone's book, "A Nun on the Bus: How All of Us Can Create Hope, Change, and Community," he concurred with her that the U.S. Constitution does not refer to "We the rich," "We the politicians" or "We who got here first." "The Constitution is about 'We the people.' It sounds corny but that's exactly what it is," said Biden. "That's why the work to increase voter registration is so important." The vice president also focused on equality and the middle class. On minimum wage, Biden said: "There's no reason in the world any American should work 40 hours a week and be $7,000 below the poverty rate. That should not happen in America." Despite the fact that the nation's gross domestic product is up by 20 percent in recent times, middle class wages have only gone up by about 14 cents on average, Biden added. "Productivity and growth have gone up, but wages are flat," he said. He also lamented the lack of consensus among political parties. On income inequity, he said between 1979 and 2005, the income of the top 1 percent in the country grew to 20 percent of all income in the country. "The middle class and poor have taken a hit. They share a lot less," he said. Biden began his remarks noting he had 12 years of Catholic schooling. In her introduction of the vice president, Sister Simone said, "With the vice president, we share faith and a commitment to democracy." The monthlong tour is to cover 5,252 miles and go from Iowa to Minnesota, Illinois, Michigan, Kentucky, West Virginia, North Carolina, Louisiana, Georgia and Colorado. Network plans 75 events in 36 cities. Sisters taking part in the Iowa leg of the "Nuns on the Bus" tour, organized by Network, included: Mercy Sister Kathy Thornton, of Cedar Rapids; Sister Mary McCauley, a Sister of Charity of the Blessed Virgin Mary, of Dubuque; Sister Marge Clark, also Sister of Charity of the Blessed Virgin Mary, who is from Dubuque and works with Network; three members of the Congregation of the Humility of Mary -- Sisters Elaine Hagedorn and Marilyn Jean Hagedorn, both of Des Moines, and Bea Snyder, of Dubuque; Sister Marge Stout, a Dubuque Franciscan living and ministering in Sioux City; Franciscan Sister Jan Cebula, of Clinton; and Sister Rochelle Friedman, a Sister of the Presentation of the Blessed Virgin Mary, of Dubuque. By Anne Marie Co"We the people, we the voters" is the theme of the third "Nuns on the Bus" tour, which kicked off Sept. 17 in Des Moines with Vice President Joe Biden thanking the sisters for their effort.